Lenovo is spewing laptops this year at CES 2014. From tablets, mid-range laptops to multimedia laptops, the world’s top PC maker is at it again. Let’s start with the company’s refresh of 2012’s most desirable Ultrabooks, the ThinkPad X1 Carbon. Touted as the world’s lightest 14-inch Ultrabook, the 2013 ThinkPad X1 Carbon takes the breath away just as it did in 2012, and last year when Lenovo added a touchscreen to the ThinkPad X1 Carbon Touch. 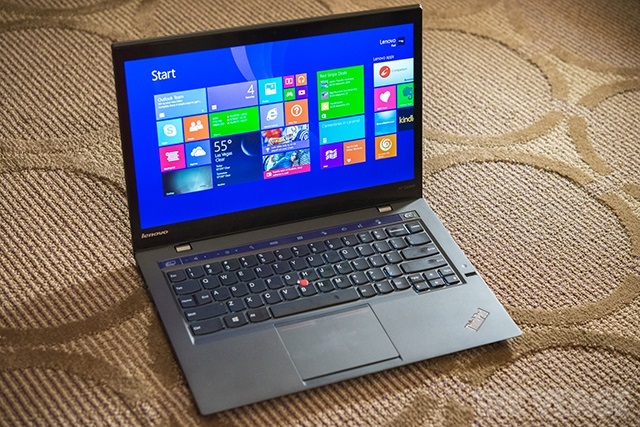 With the updated hardware, the X1 Carbon is as premium as an Ultrabook gets. The 14-inch display has been bumped up from 1600 x 900 to a touch-enabled 2560 x 1440 resolution ColorBurst display, while the inclusion of the latest Intel Haswell Core i5 and i7 chipsets allow the X1 Carbon to be further slimmed down by 0.15cm to a svelte 1.73cm, and shaves its weight by about 45g. Despite that, the new Haswell processors also means that the X1 Carbon will now run for up to 9 hours on battery, a 70% increase from the previous generation. In addition, the ThinkPad’s Rapid Charge technology is also present here, allowing the Ultrabook to charge from 0 to 80% in under an hour. There’s also optional 4G connectivity to ensure effortless connectivity while on the go. On top of that, Lenovo also offers an optional OneLink Pro Dock, housing multiple USB ports, audio and Ethernet connections and driver-free dual video support through DisplayPort and DVI. The integrated 90W AC adapter also provides power for the Ultrabook, supports Rapid Charge and can also charge other devices such as a smartphone. Unfortunately, the seemingly perfect package is somewhat broken by Lenovo’s attempt at revolutionizing the ThinkPad keyboard. The ThinkPad X1 Carbon introduces several new elements, one of which is called Adaptive Keyboard, which replaces the Function row of buttons with a touch strip that dynamically changes based on what applications are open at the time. By default, the Fn keys are present together with Windows 8 shortcuts such as search and screenshot, but when VoIP calls are made, the touch strip changes to highlight keys such as mute and other controls. While Adaptive Keyboard is a pretty nifty addition, Lenovo didn’t stop there. The legendary ThinkPad keyboard layout has also been tweaked. Like the IdeaPad keyboard, the Delete key is now to the right of Backspace – and that’s not right. Worse, Lenovo completely removed the Caps Lock key. In its place are the Home and End keys, which look completely out of place. Nevertheless, even with the suspect keyboard, the Lenovo ThinkPad X1 Carbon is still one of the top Ultrabooks around. It is available in the US from today with a retail price that starts from $1299 (about RM4350).